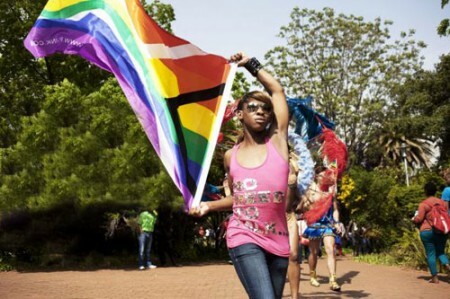 The South African government has announced in the official Government Gazette that the Gay Flag of South Africa has been approved and accepted as the country’s official gay flag (an adaptation of the international gay flag and the South African national flag). This makes South Africa the first country in the world to officially recognize a gay flag, and likely any official LGBTI symbol. The Department of Arts and Culture through the Bureau of Heraldry designs and registers heraldic representations such as flags and is guided by the Heraldry Act, which governs the use and protection of national symbols which is currently under the authority of the Minister of Arts & Culture. “The Gay Flag of SA is now officially recognized and protected by the Department of Arts and Culture and the government of South Africa,” said Mava Mothiba from the department. The Gay Flag of South Africa (GFSA) group is currently on tour in South Africa with a showcase of acts, going from town to town promoting the Gay Flag, equality and the right to live free of homophobia in South Africa. © Melanie Nathan. For more by Melanie Nathan, click here to visit her blog.